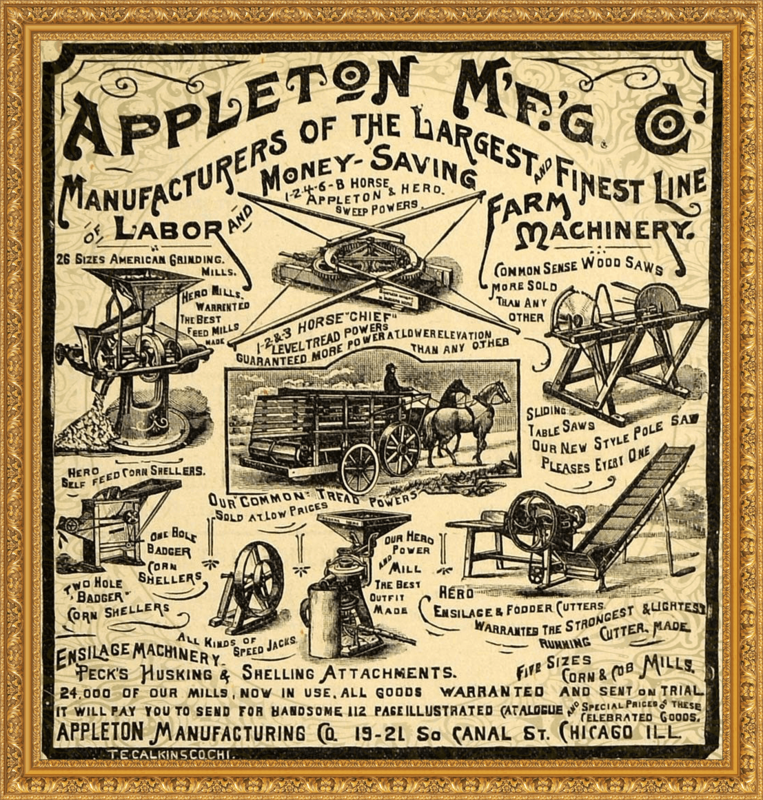 The Appleton Manufacturing Co., the products of whose workshops are unrivaled in the markets of the world, was incorporated in 1875 upon a capital of $25,000. Which was afterwards increased to $150,000. The company occupy very extensive and perfectly equipped factories. employing more then 150 workmen, many of whom are highly skilled in their several avocations, while their trade is co-extensive with the limits of agriculture. Besides manufacturing the justly celebrated “Badger” feeder, the company produce a general line of agricultural implements, cultivators, harrows, corn-shellers, feed-cutters, hay carriers, etc., making a specialty of the “Modern Hero” horse-power grinding mill, all of which, are offered to the public entirely upon their merits, at prices and upon terms within the reach of all, and which find a ready market wherever introduced. the officers of the company are well known and highly esteemed business men, of established reputation,whose successful conduct of the vast interests in their charge evidences their fitness for it. The President, Mr. John S. Van Nortwick (1847 – 1909), is a resident of Batavia, Ill., where he is extensively engaged in the paper business, and has been connected with the Appleton Manufacturing Co. for the last three years, being also identified with various other manufacturing interests in this and other cities. Mr. Guilford D. Rowell (1834 – 1912), the general superintendent, though born in spring water, Livingston County, New York, in 1835,has lived in the west since seven years of age, and is thoroughly imbued with the spirit of progress of the times. Becoming a permanent resident of this city in 1873, he at once engaged in the manufacture of farm machinery, and in 1876 assisted in organizing the present company, whose business he has always managed and whose president he was for two years. Mr H.J. Rogers, the vice president, is a native of New York state, and has been identified with the company for the last three years, than whom no one is more widely known in connection with the industries of this city, being also actively connected with Appleton Paper and Pulp Co., the Appleton Boot and shoe Co., the Appleton Gas Co., and the First National Bank. Mr D.W. Starkey, the treasurer, is a native of Western Pennsylvania, and has been engaged in the paper business for the past ten years, coming to Appleton in the spring of 1886 to accept is present responsible office; while Dudley G. Rowell (son of Guilford D.), and secretary to the general superintendent, is a native of this state and has been identified with the company since its organization. All the parties mentioned are thoroughly identified with the best interests of Appleton, and are gentlemen whose reputations are such that eulogy would be superfluous. Under their able guidance the company has achieved a prominence accorded only to those whose transactions are based on the strictest principles of mercantile honor, and those entering into business relations with them may rest assured of receiving such advantages as are in full accord with their well known liberal policy. The company have a branch office and salesroom at No. 22 South Canal Street Chicago, Ill.